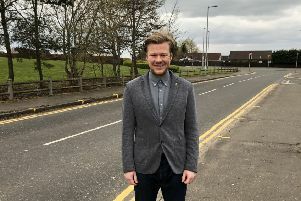 Drivers will face disruption in Motherwell town centre for up to a month as SGN return to complete a project started last spring. Gas distribution company SGN began work to replace old metal gas pipes in Hamilton Road last year and on Monday will start work on the final phase outside Motherwell Library. At the start of the work Hamilton Road’s junctions with High Road and West Hamilton Street will be closed meaning to access to and from the cross. It is intended that as the work carries on the lane heading towards the cross will be opened back up. SGN hope to have the work completed in three weeks, but the closure order could be place until Sunday, August 6, if necessary. SGN spokeswoman Hannah Brett said: “We’re now returning to complete the final phase of this project, which will see us upgrade our network outside the library. “To minimise disruption, we’ve planned with the local authority to carry out this phase during the school summer holiday as the roads are traditionally quieter at this time of year. We’ll also be working extended hours during the week and at weekends to complete this final phase as quickly and safely as possible. Signed diversions will be place to take drivers round the closure.